CrockPot Granola with Coconut Oil. An easier way to make this healthy gluten-free snack in a slow cooker instead of the oven. 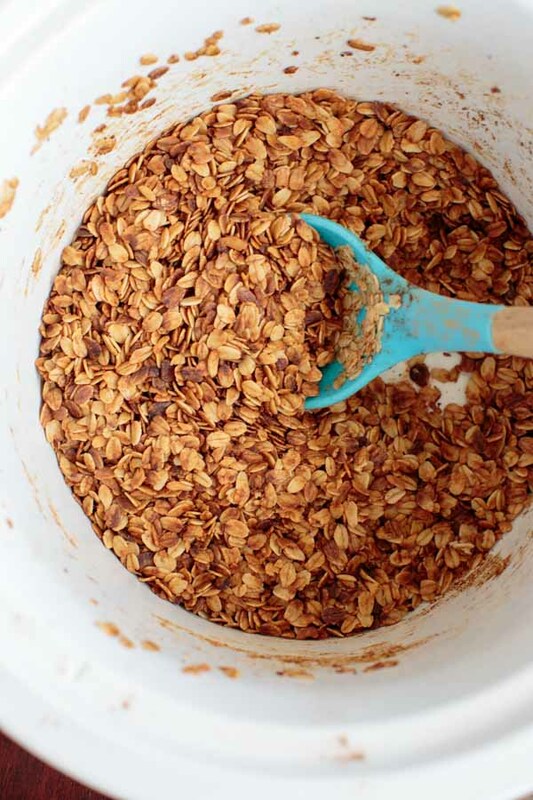 My aunt has a favorite granola recipe that everyone loves. She makes it all the time and it makes her so happy that people always ask for the recipe. This, um, isn’t that granola recipe. She’s very protective of her recipe! The point of me telling you this is because this is not the most elaborate, everyone-asks-for-the-recipe type granola. 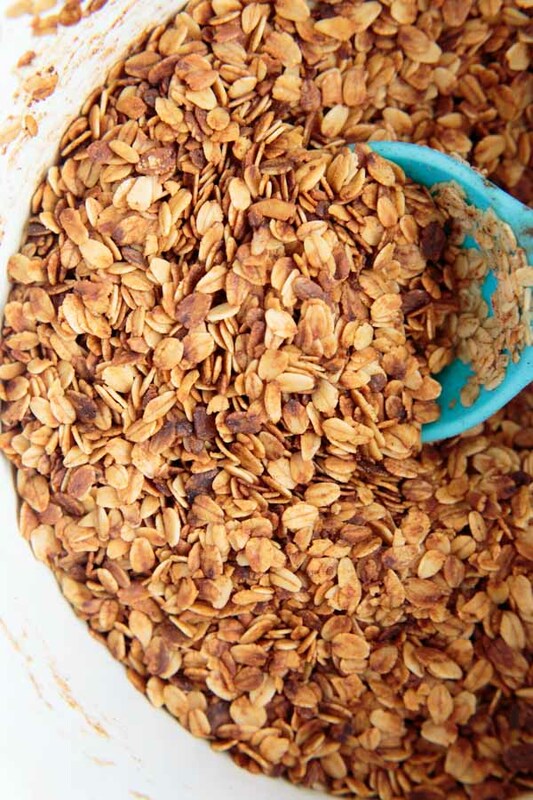 But it IS a healthy, easy, totally customizable slow-cooker/crockpot granola recipe, made with coconut oil. 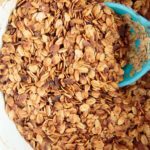 I like to think of this as the basic crockpot granola recipe, just to show you how you can make it in a slow-cooker. Then if you want to add nuts, seeds, what-have-you, you can do so. But it’s still really good without any of those things. A secret I learned is to not put the lid on the crockpot all the way, leaving some room for moisture to escape. This will give you a crispier granola! But be sure to stir the granola in the crockpot every once in a while to prevent burning. After cooking, you’ll want to spread it out on a baking sheet to cool. Most of my granola batches end up with not many clusters, but I’ve read you can add a little flour to encourage clustering. It’s perfect for adding as a yogurt topping. I tried really hard to make this without added sugar, but I just didn’t think it was as good. A couple tablespoons of brown sugar helped. Optional add-in ideas to make it your own include chia seeds, dried fruit, almonds, pecans, shredded coconut, and other spices. CrockPot Granola with Coconut Oil. An easier way to make this healthy gluten-free snack in a slow cooker instead of the oven. 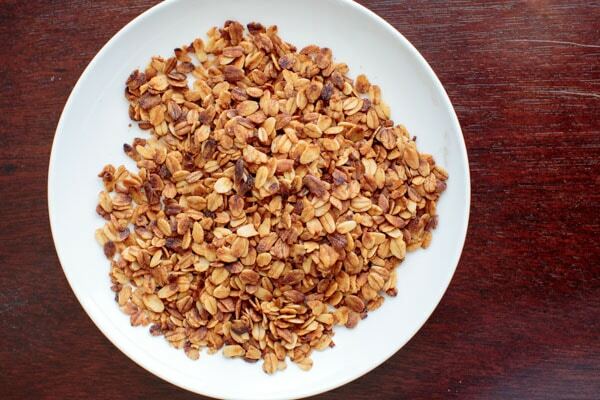 This is a good basic granola recipe that you can customize to make your own! In your slow-cooker, add all ingredients and stir together. Cook on low for 2.5-3 hours or until browned, stirring occassionally to prevent burning. 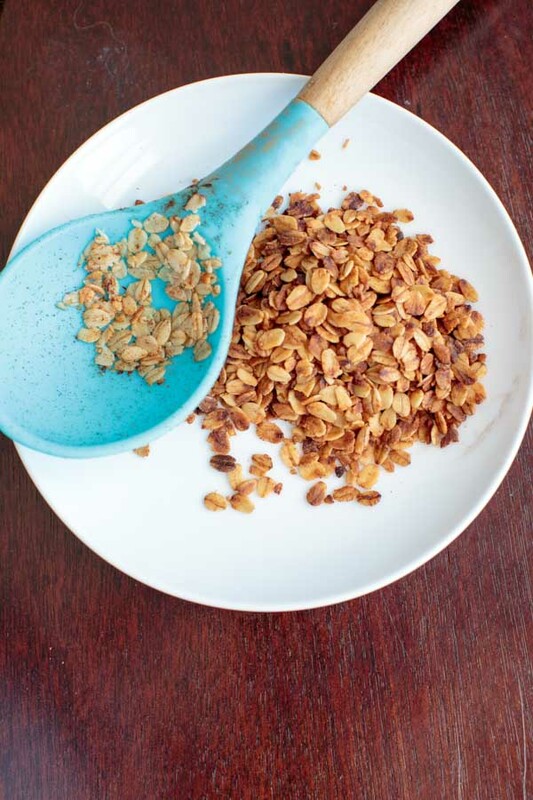 Spread out granola onto a baking sheet to cool before eating. Optional add-ins include dried fruit, nuts, seeds, shredded coconut and other spices. Depending on the size of your crockpot, you might want to double or triple the recipe. Love this!!! Leave lid on or off?